10 Then the servant took ten of his master’s camels and set out, taking with him all the bounty of his master; and he made his way to Aram-Naharaim, to the city of Nahor. The Hebrew word for ‘camel’ is gamal (גמל), which also means ‘to be independent.’ We find the usage of this word in a variety of contexts: “The child grew up, and was ‘weaned’ (vayigamal)” (Genesis 21:8); “and borne almonds” (vayigmol – i.e. ‘became independent of the stalk’; Numbers 17:23). According to Rabbi Natan Slifkin, popularly known as the “Zoo Rabbi,” the Hebrew name for camel refers to the animal’s ability to survive without water for up to seven months. 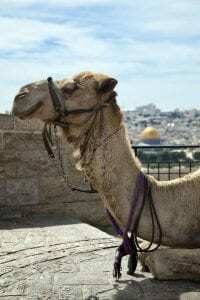 It is fitting that the independent camel was the method of transportation used by Avraham’s servant to bring back a wife for Yitzchak, as Rivka made the independent choice to leave her family in order to join Yitzchak in Eretz Yisrael.